EASILY TORN, ephemeral, evocativethe magazine page is an appropriate second home for Jesse Darling’s work. In recent years, the artist has honed a spindly, pragmatic mode of assemblage, hospitable to bent metal tubing, hoodies, medical gear, fluttering plastic bags. When combined, these unassuming materials tend to sketchily conjure bodies. In this way, Darling’s approach to representation gravitates toward deliberate weakness, manifest damage, and evocations of mutual aid, as if to anticipate and then repudiate a context of toxic masculinity and wrathful white heteronormativity. In their recent exhibition at Chapter NY, for example, Darling arrayed dreamily bent crutches, wall-mounted and white-painted steel tubing that slanted outward like a giant pair of etiolated, striding legs, and a toilet for the disabledits grab bars animatedly angled like arms, while elongated metal tubes reached to the floor to suggest an organism hobbling forward, or away. These unsteady means of support temporarily supported one another: They implied an ad hoc posse, transforming individual failings into communal strength. If the covert potential of underdog communities has been central to Darling’s work for some time, so has engagement with print media. See, for example, the hashtag turned poster project #losermilitia, 2016: AND YOU WILL KNOW US / BY THE ASTHMA INHALERS / AND ANXIETY MEDS / THE TICS AND ALLERGIES / DRINKING PROBLEMS / THE CRYING ON THE BUS / WE ARE THE MISSILE, it reads, garlanded with sweet illustrations of flies. 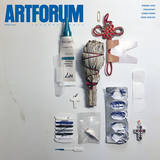 For Artforum, Darling presents something in between such circulatory work and their relatively substantial, if still pointedly nonmonumental, gallery practice. What follows is a sequence of images that ask to be read as fugitive sculpture, or as toward sculpture: here for the moment, glimmeringly articulate, its assembly requiring no physical strength, its components trashed after being documented. Some of this was created on the top of a defunct refrigerator that Darlingessentially housebound at the time, unable to use their right arm and reliant on a shaky leftpressed into service as a kind of sketchpad. (Variations on some of these iPhone images were beamed out via Darling’s Instagram account, untethered from ontological certainty about their art status. Crossing onto these pages, where they jibe with conceptions of the “poor image,” they remain somewhat unfixed.) The unremarkable domestic sphere, viewers might infer, can enlarge wildly if one inhabits it deeply enough; can become ghosted with magical thinking. One image, featuring what Darling groups as “prophylactics, charms, and placebos,” grids together a selection of what might be considered faith objects: antiaging cream, a Chinese good-luck keepsake, crosses, a baton of sage, a pricey anti-decay toothpick. If this kind of amalgamation suggests you have to build your own hopefulness out of what’s around (and also, along the way, unabashedly illuminates the artist’s own compromised living conditions), such a reading is reaffirmed by imagery relating to Saint Jerome, the Italian priest and translator, who legendarily plucked a thorn from a lion’s paw and subsequently adopted the beast as a study buddy. In Darling’s left-handed, obliquely queered retellinga drawing, or, as it is subtitled, a “temporary relief,” mounted on chopsticks and held up in a double-handed griptwo bloodied lions smooch. Another transitory sculpture incorporates a child’s leonine toy and a crutch into Saint Jerome’s staff, here converted into a wand of sorts. Jerome himself, where he appears, is far from a hero here, more a paternalistic figure demanding fealty and conformity in return for healing. (See, relatedly, the bellicose parade of repurposed dildos.) As posited by this alternative narrationand by Darling’s practice at largethe injured might be better off finding others like them and, helped by companionship, living through the hurt.